Kate Troescher and Nicole Everett say they're doubly lucky – because they found each other, and because they were able to get married in their home state of California during the brief window when it was legal. "Right when we started dating, I thought we fit really well," says Nicole. "Kate helped me be a little more silly, and I helped Kate be a little more serious. We are absolute complements in every way." But, Nicole adds, there's more to it than that. "I think that for everyone who has been in love, you just sort of know," she says. "There's an unspoken spark or connection that you either feel in somebody or you don’t. You just feel excited around them – you get butterflies, and you know there’s something that attaches you to them." "We fell in love really quickly," says Kate. When the couple got engaged, it wasn't possible for them to get married in California – but they still planned a ceremony. "We were going forward with doing a traditional wedding regardless, because that’s what we wanted to do – to celebrate with our friends and family," says Nicole. "It’s one thing to just say to each other, 'I'm committed to you and I love you,' but it’s a totally different thing to declare that in front of your friends and relatives and the world in general. You want to yell at the top of your lungs to everybody that this is the person that you want to spend the rest of your life with." 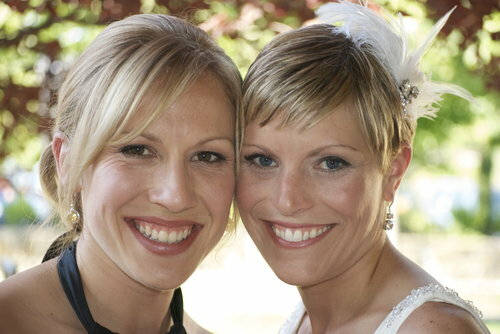 Then in June of 2008, when the California Supreme Court decision meant the state had to issue marriage licenses for gay couples, Kate and Nicole jumped at the chance and got married at San Francisco City Hall. There wasn't enough time to plan their full ceremony, which they held on their one-year anniversary. If they had waited, they would have missed their opportunity because of the passage of Proposition 8 in November. "Something changed the day that we were able to get married at City Hall, and it just got even better after Nicole was able to wear her white dress and we were able to say our vows in front of all of our friends, who we wanted to experience our wedding and marriage," says Kate. "The fact that marriage isn’t legal once again in California, it really puts it in perspective for us every day. Not a day goes by that we don’t feel lucky that we are able to call ourselves married, because so many of our friends who are also in long-term committed relationships can’t have it." These days Kate and Nicole try to enjoy being together as much as possible – which doesn't seem like much of a challenge. "We’re two really active people, so we’re always looking for something to get out and do together, like biking or hiking," says Nicole. "Although I will admit that it’s just as nice ordering some take-out and cuddling up on the sofa to watch a movie. We do basically everything together – we’re pretty much an inseparable couple. We’re so lucky."